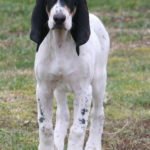 This breed is the living progeny of the now extinct Saintongeois Hound and the Grand Bleu de Gascogne. 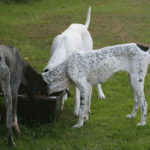 This breed has the characteristics and the physical features of the two breeds from where it was developed. The Grand Gascon Saintongeois is first and foremost a hunting breed, one that has great strength, staying power, an ultra sensitive smell, a deep powerful voice and great perseverance that makes the breed a competent hunter of large game like deer, wild boar and foxes. This dog is cunning and intelligent, well able to maneuver and drive the game to the point of the hunter’s gun. The Grand Gascon Saintongeois that was originally developed to hunt roe deer because of its speed may not be as large as the Grand Bleu de Gascogne but it has a more elastic gallop. These dogs will hunt in packs or individually and it can not be avoided that cuts and nicks will result from working in dense vegetation. Wounds and scars that would result from encounters with bigger game are considered to be honorable wounds and show the courageous nature of this breed. At a glance one will notice and be impressed by the Grand Gascon Saintongeois’ muscular physique and elegant appearance. This is a proud breed that carries itself in a dignified manner. 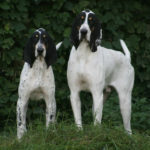 A Grand Gascon Saintongeois would commonly have a predominantly white coat that is made impressive by black markings that covers the sides of the head and the ears, pale tan cheeks, tan markings inside the ears and tan dots over the eyes. In January 1, 1993, the Grand Gascon Saintongeois was officially recognized by the United Kennel Club. This breed is valued by hunters in France but it has not gained recognition from other countries. This outstanding hunting breed is on the brink of extinction. Utilization: Great Gascon Saintongeois: Dog used for shooting and sometimes hunting big game but also hare; generally with the pack or alone as a sleuth. 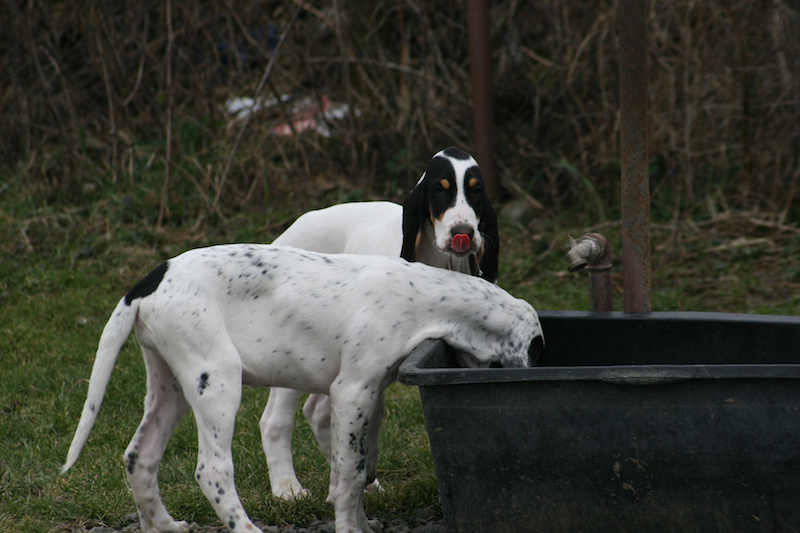 Small Gascon Saintongeois: Versatile dog used for shooting. Its origins make it a hare specialist but also a good hunter of big game. Classification F.C.I. : Groupe 6 Scenthounds. Great G.S. : Section 1.1 Large sized scenthounds. With working trial. Small G.S. : Section 1.2 Medium sized scenthounds. With working trial. Great G.S. 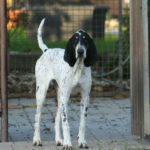 : In the middle of the 19th century the Count Joseph de Carayon-Latour, wanting to regenerate the declining breed of the Hound of Saintonge, crossed the last descendants with the Bleu de Gascogne of Baron Ruble, thus creating the Gascon Saintongeois but causing the extinction of the Hound of Saintonge. Small G.S. : In the middle of the 20th century some hunters from the South West of France selected the smallest subjects from their litters of Great Gascon Saintongeois and thus created this variety, intended originally for hare hunting. Great G.S. : Very well constructed dog, giving at the same time an impression of strength and elegance. Very French in type with regard to the head, coat and expression. Small G.S. : Medium sized dog, well proportioned and distinguished. Height at the withers/scapular-ischial length, ratio 10/10.5 Length of muzzle equal to that of the skull. 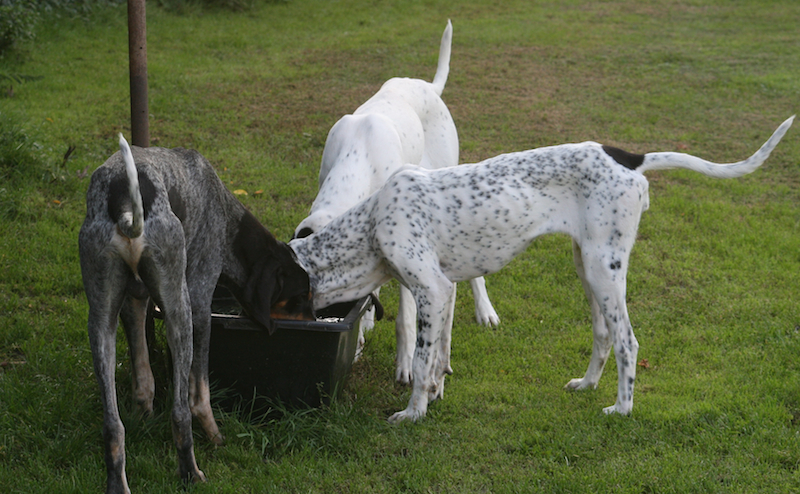 Pack hound par excellence, fine-nosed, wide-casting and endowed with a very sonorous voice. Joins the pack instinctively. Calm, affectionate and amenable to orders. Head: The lines of the skull and the muzzle are divergent. Skull: Seen from the front, domed and rather narrow; the occipital protuberance is well defined. Seen from above, the back of the skull is of a pronounced ogival shape. Nose: Black, well developed; nostrils well opened. Lips: Covering the lower jaw; corners discreet. The edges of the lips are black. Jaws: Scissor bite. Incisors are set well square to the jaws. Eyes: Oval shape; brown. Edges of eyelids are black. Gentle and trusting expression. Ears: Fine and curled, they should reach at least the tip of the nose. Set on below the level of the eye and placed rather backwards, freeing the skull. Neck: Of medium length and thickness. Slightly arched with little dewlap. Back: Very taut, without excess in length. Loin: Well attached, slightly arched, quite muscular and not too long. Croup: Of good length, slightly sloping. Chest: Broad and long, reaching the elbow. Forechest rather broad. Ribs: Slightly rounded and long. 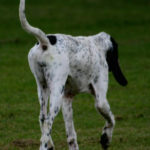 Tail: Strong set on; tapering well to the tip, reaching the point of the hock. Carried elegantly like a sabre. Shoulder: Quite long, muscled; moderately oblique. Feet: Slightly elongated oval; toes lean and tight-fitting. Pads and nails black. Hock: Broad, well angulated and well let down in line with the body. SKIN: Supple and not too thick. White with black patches. Colour: The ground colour is white with black patches and sometimes speckled but not excessively. Two black patches are generally placed at either side of the head, covering the ears, surrounding the eyes and stopping at the cheeks. The cheeks are tan, preferably pale. Two tan markings placed above the superciliary arches give the eyes a “quatroeillé” (four-eyed) appearance. Traces of tan are also found on the inner side of the ears and in speckles along the legs. Some fawn hairs may appear on the upper part of the ear but without giving the head a tricolour appearance. Sometimes at the base of the upper thigh there is a typical dead-leaf marking called “roe buck mark”. Small G.S. : Males: 56 to 62 cm Females: 54 to 59 cm With tolerance of +/- 1 cm. The Grand Gascon Saintongeois is a handsome energetic dog with impressive good looks and graceful but powerful movements. This breed has a strong elongated head that is covered with loose skin that forms wrinkles in the cheeks. Upper lips cover the lower jaw and white well fitted teeth meet in a scissor bite. Oval shaped eyes that are dark chestnut brown in color have a trusting though confident expression. Twisted thin long ears are set below the level of the eyes, taper to a point and hangs in a drop ear style close to the check. Black nose has open and well developed nostrils. Long tail that reaches the hock has a strong base and tapers to a point. The tail is always carried elegantly. 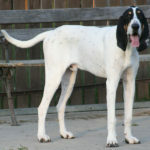 This breed has a predominantly white coat with black spots. Although rare some individuals have an all white coat. The “mark of the deer”, a leaf brown colored marking is an identifying and distinct feature of the breed. This mark is found at the back of the dog’s thigh. The weather resistant smooth strong hair profusely covers the entire body and the limbs of the dog. White hair grows on pink skin and black hair grows on black skin. These dogs have well developed bodies. The oval shaped chest is long broad and deep, the back is long and firm and the slightly arched loins are well muscled. This breed has muscular shoulders. 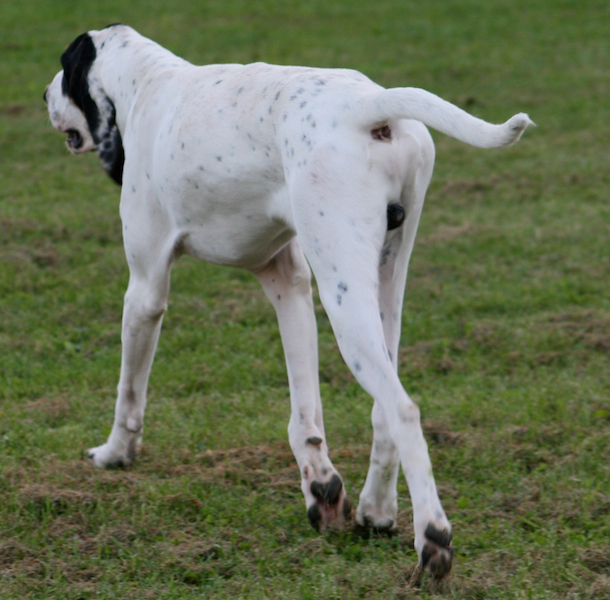 The well boned and powerful forelegs and hind legs provide the dog the power to have an elastic gallop and a graceful gait. A Grand Gascon Saintongeois grows to an average height of 28 inches and weigh from 65 to 70 pounds. The Grand Gascon Saintongeois may be a through and through hunter, valued by the hunting enthusiast in the family but the breed does have a gentle, calm and affectionate nature… qualities that endears the dog to other members of the family. A Grand Gascon Saintongeois makes a wonderful family companion as this is an obedient breed, always eager to please and acquiescent to the commands of the master. This breed is patient and gentle with the younger members of the family. A well socialized dog will be a good companion and playmate of the children. Accustomed to hunting in packs this breed gets along well with other dogs although care must be taken in allowing the dog to be around other smaller pets. This breed has a strong prey drive and may see other pets as prey. This breed is friendly with people it recognizes but can show aggression towards strangers. Early socialization and training is therefore necessary to curb these unwanted tendencies of the dog. 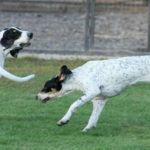 Training would not be a problem as these dogs are intelligent and known to respond well to positive methods of training. 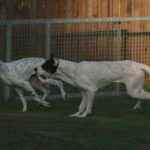 This breed would do well in a kennel or in a home with a large well fenced yard. This is a working breed and they would naturally require vigorous exercise. These dogs should never be kept in apartments as apart from the tendency to bark when bored and when parted with the human family for a considerable time, these dogs would yearn for large open spaces. These dogs have very little grooming needs. The short smooth coat practically cleans itself as it naturally repels dirt. Regular brushing would remove dead hair and maintain the good condition of the skin and the coat. 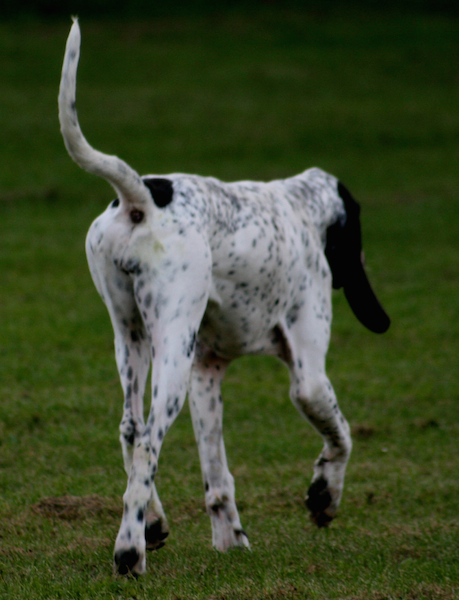 As with other breeds of hunting dogs with pendant ears, this breed is also prone to ear infection. Regular ear cleaning is necessary. 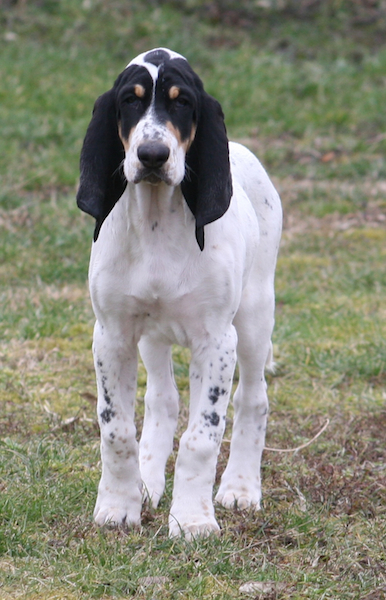 The Grand Gascon Saintongeois is also known as the Virelade Hound. 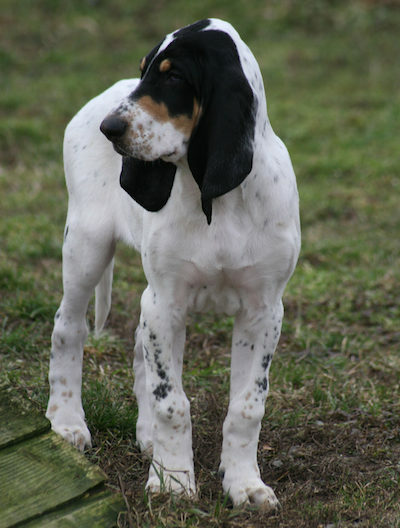 This breed of hunting hound was originally developed in the Saintongeois region of France. 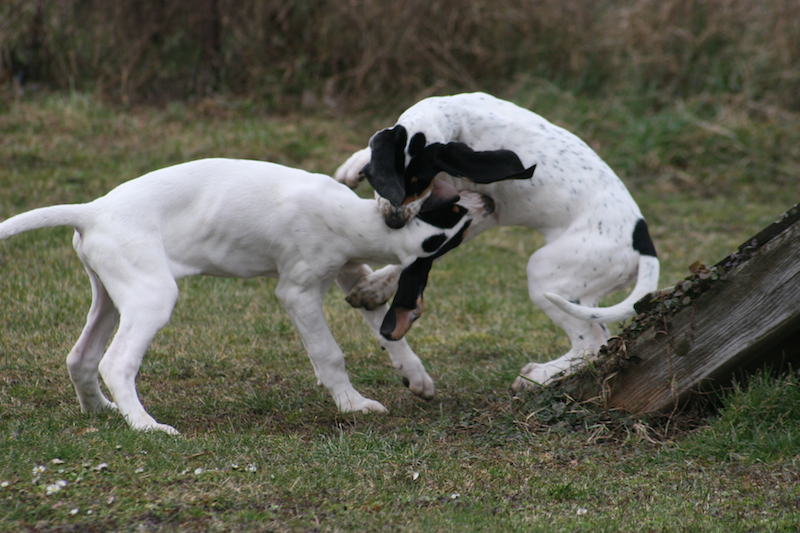 This breed is a fairly new addition to the breeds of hunting dogs. 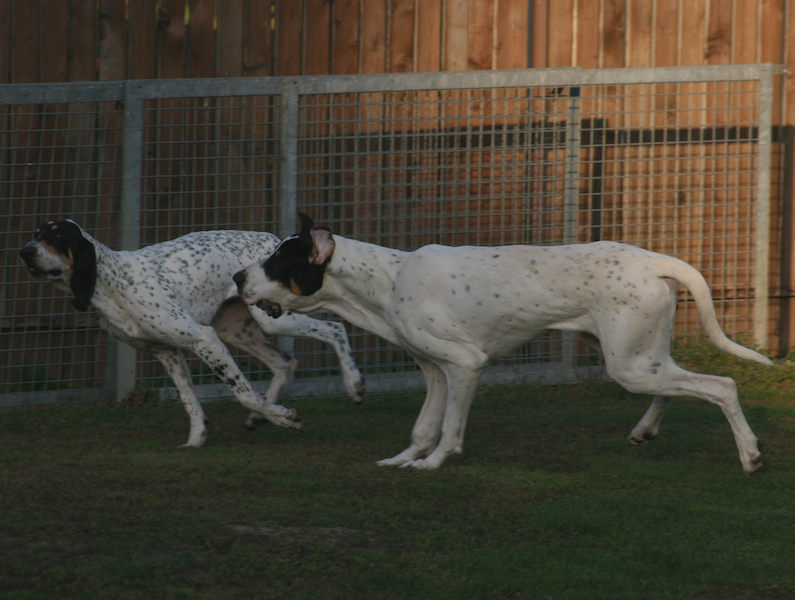 However, the Saintongeois hound and the Grand Blue de Gascogne, the ancestors of this breed has been around for hundreds of years. These dogs have proven themselves to be outstanding hunters. 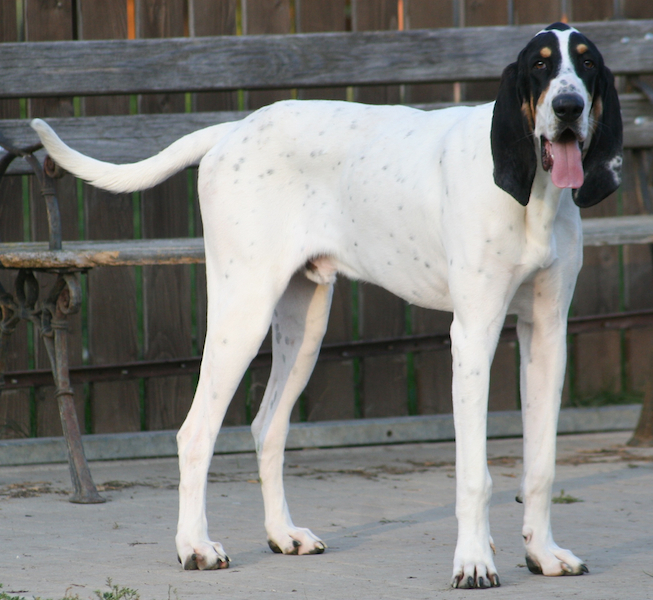 The Grand Bleu de Gascogne, an ancestor of the Grand Gascon Saintongeois, is a large and leggy hound that hails from the Gascony province on the southwestern part of France. This breed is known for its impressive stature and remarkable beauty. This breed is noted for being a tenacious hunter with a deep melodious voice. The Saintongeois hound was favored by the French nobility as the breed was acclaimed for its outstanding ability to hunt wolf. However, after the French Revolution the popularity of the breed waned. The Saintongeois hound fell into disuse when the hunting privilege that was exclusively granted to the French nobility was abolished. Moreover, the Saintongeois was weakened by in breeding. Baron Joseph de Carayon-LaTour of Chateau Virelade had undertaken the task of reviving the Saintongeois Hound. Very few specimens of the breed survived the French Revolution. 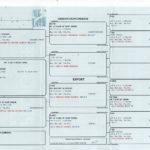 A male and a female were acquired by the Baron from the Earl of Saint Legien. 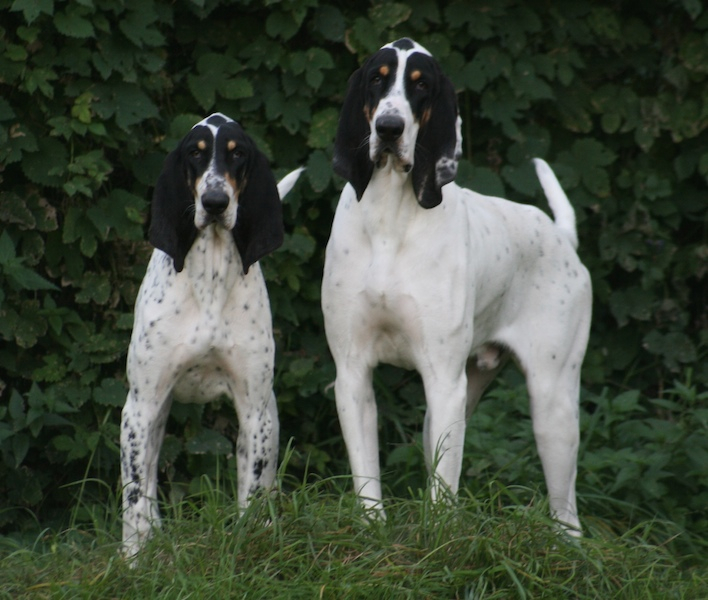 These dogs were mated with the Grand Bleu de Gascogne from Baron de Ruble’s kennel. The progeny of the breeding were dogs of outstanding quality. This made the two gentlemen continue with the breeding. 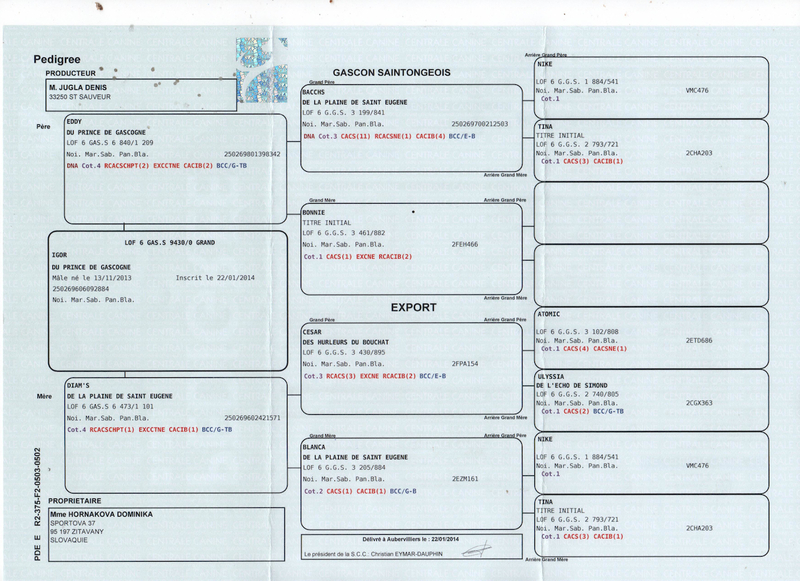 The breed that was created is the Grand Gascon Saintongeois we know today. 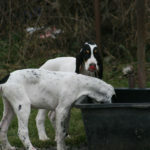 Baron LaTour however, failed to revive the Saintongeois Hound as the breed is now extinct. Instead of reconstructing the Saintongeois a new breed was created because the blood of the Grand Bleu de Gascogne is too dominant. 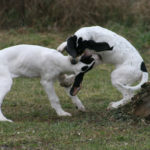 The Grand Gascon Saintongeois is a large breed of dog that was originally utilized by hunters to track game because of its heightened scenting ability. Later on the outstanding hunting qualities of the dog came to the fore. 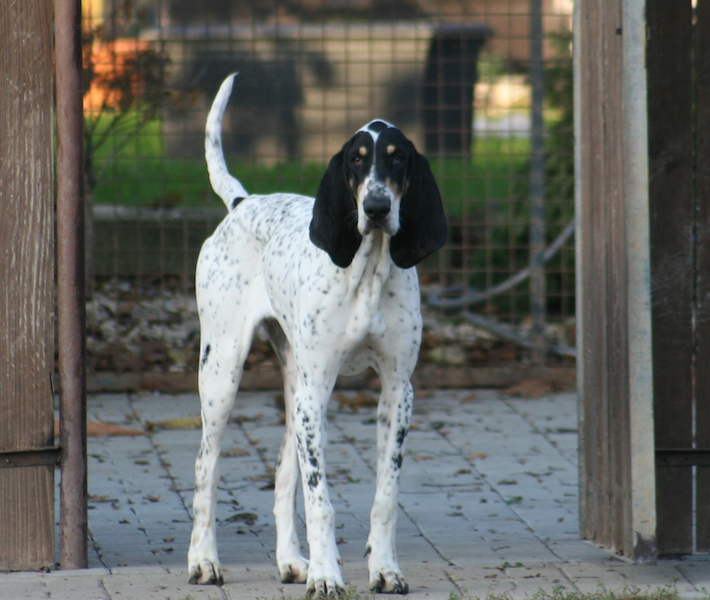 This breed has inherited the remarkable beauty and the deep melodious voice of the Grand Bleu de Gascogne as well as the outstanding hunting ability of the Saintongeois Hound. The Grand Gascon Saintongeois is most prized by French hunters for its outstanding ability to hunt deer, fox and boar. This is a loving and friendly breed. Because of its well balanced temperament, this breed has become a much loved home companion. In spite of these qualities, the breed has not really gained recognition outside its country of origin. The Grand Gascon Saintongeois is in fact on the brink of extinction despite the dedicated efforts of some breeders to revitalize the breed.